Farewell ceremony with Russian Ambassador Andrei Karlov in Turkey in Ankara airport. 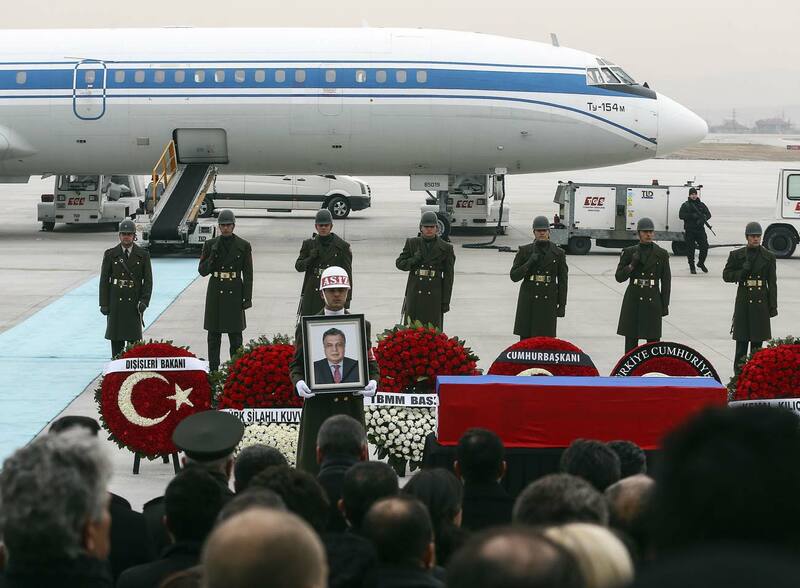 A chartered flight airlifting the body of Russia's Ambassador to Turkey, Andrei Karlov, who was assassinated in Ankara on Dec. 19, has landed at Vnukovo airport in Moscow. The ambassador's widow arrived by the same flight accompanied by a physician and a psychologist dispatched by the Ministry for Emergency Situations and Civil Defense. Russian Foreign Minister Sergei Lavrov said earlier he would come to the airport personally to meet the flight. Turkish embassy in Moscow said Foreign Minister Mevlut Cavusoglu, now visiting Russia, would also be at the airport to take part in meeting the flight. An armed man whom the police identified later as a 22-year-old former police officer opened indiscriminate fire on Dec. 19 in an arts gallery in Ankara where Ambassador Karlov was opening a photo exhibition. According to Maria Zakharova, the Russian Foreign Ministry's official spokesperson, Karlov received a gunshot wound, of which he died at hospital later. Turkish officials said the attacker was eliminated on the spot. Apart from the ambassador, he wounded three more people.